This is a Scottish locational surname of great antiquity. Recorded in many forms including Arcarse, Arcase, Orcas, Harcarse, Harkus and Harcus, it orginates from an estate known as 'The lands of Harcarse' in the parish of Fogo, in Berwickshire. The surname is first recorded as early as 1216, when Adam de Harcarse was elected abbot of Newbottle, and then only three years later he received the top posting of abbot of Melrose. It seems that the family prospered, because in 1254 the name is recorded in some status when Sir Alan de Harcares witnessed a gift of land to the monks of Coldingham, and it may have been the same person who witnessed a charter on behalf of the Earl of Dunbar in 1289. 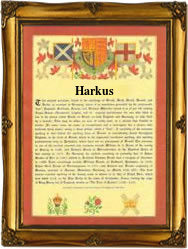 In fact for three centuries the nameholders played a prominent part in Scottish history, with Alexander de Harcars being sherrif of Perth in 1305, and Thomas Harcars, the prior of Arbroath in 1482. Something changed though in the early part of the 16th century and a number of members of the 'clan' removed to Orkney. Whether this removal was 'voluntary' or more sinister is unclear, but in 1539 three members were arrested for assisting in the murder of of the earl of Caithness. The final recordings from the last days of the post medieval period include: William Arcas given as being the baillie of Kirkwall in 1568, and James Harcas, a member of the Scottish Parliament in 1605.